The XPRO Over 4-Section Aluminum Monopod with 234RC Tilt Head from B&H is a lightweight, sturdy camera support kit which consists of a 4-section aluminum monopod and 90° tilting head. The combined kit weighs just 2.2 lb, reaches a maximum height of 73.2", features a folded length of 24.8", and supports up to 4.4 lb. The MPMXPROA4US XPRO Monopod+ from Manfrotto is a versatile aluminum support designed for use with DSLR, mirrorless, compact, and video cameras. A handy tool for nearly any visual artist, professional, or content creator, a monopod can often travel places tripods cannot, providing additional stability and supporting heavy equipment when required. The MPMXPROA4US features a 4-section design which, when paired with its aluminum construction, results in an easy-to-transport design weighing just 1.65 lb. With a maximum height of 70.9" and a minimum height of just 22", the MPMXPROA4US can be adjusted to suit users of varying heights and for various different tasks. While the design of a monopod is relatively simple the Manfrotto Monopod+ line utilizes some innovative features which make using the MPMXPROA4US fast and easy. The primary feature of the line is the inclusion of Manfrotto's patented Power-Lock flip locks which snap open and closed to ensure fast operation and a tight, unyielding lock. The D-shaped leg sections have been designed not only to compliment the Power-Locks but also to prevent unwanted twisting between leg sections and increase the stability of the monopod. Additionally, the Monopod+ line also features Manfrotto's standard rubber leg warmer for an improved grip and an adjustable hand strap for extra security. A 1/4"-20 and 3/8"-16 mounting thread is placed at the top of the monopod in the center of the baseplate, allowing users to either, direct mount a camera or lens, or use an articulating head if required. Box Dimensions (LxWxH) 23.2 x 3.3 x 3.1"
XPRO Over 4-Section Aluminum Monopod with 234RC Tilt Head Kit is rated 5.0 out of 5 by 6. Rated 5 out of 5 by Chris from This improved version is even better The section flip-lock seem better than the previous model I had, extending out slightly more for easier feel without looking, and lock securely. The extra height is appreciated for normal operation for tall people, but also for those times when you sit the foot down on ground lower than your own feet. I was hesitant about the low support rating of 4.4lb for my DSLR and big lenses, until I remembered that those larger lenses have rotating collar rings, so I could get a portrait orientation without using the tilt of the head. The tilt will still come in handy with the lighter lenses, which do not have collar rotation. The adjustment tool ring that comes on it will fall off at the first opportunity, so take it off immediately and store it, or you'll lose it. This true for all models, not just this one. Rated 5 out of 5 by Harry Branson (real name) from Great Product; I would buy it again if I had to Purchased for my new Sony DSC-RX10M3 with the 24-600MM lens. Camera needs stabilization at 600MM. Tilt head is perfect for portrait pictures. Rated 5 out of 5 by Anonymous from Great Value Excellent investment. I use it with my Canon 80D and Sigma 150-600 lens. Lightweight but sturdy. I'm 6'2, and when fully extended, the monopod head is above MY head. Great for shooting elevated subjects. LOVE the clamp-style section locks (vs twist-knobs). Rated 5 out of 5 by GB from Quite sturdy This monopod seems very sturdy, which is obviously the point. Probably not the smallest and lightest. Head should make for faster lens changes when using zooms that have their own mounting point. Rated 5 out of 5 by Don P. from A definite recommend product . It's great heavy duty construction will provide years of use . 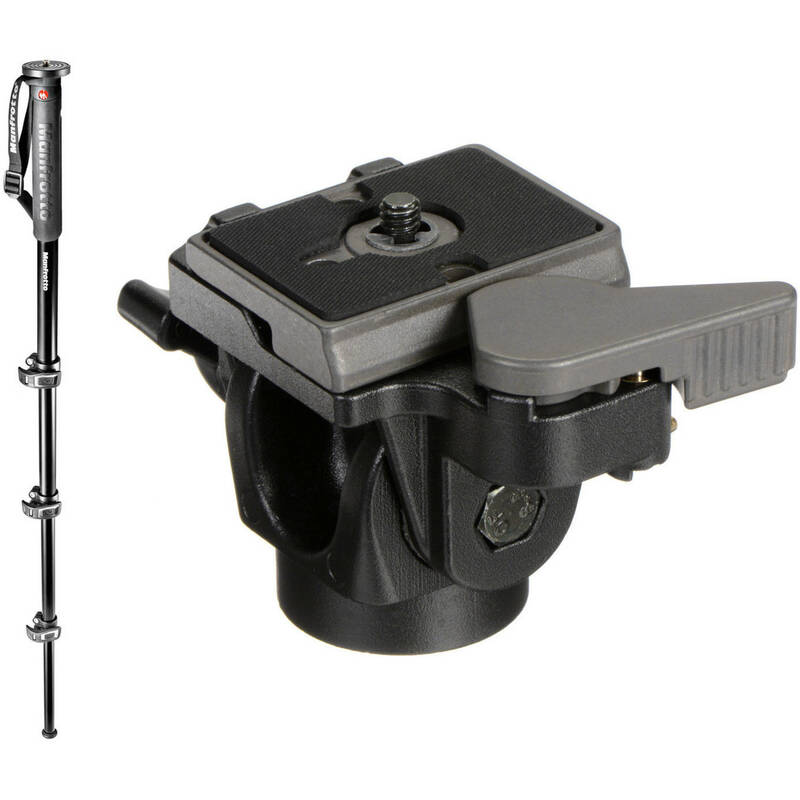 Can the bottom spike be removed to mount onto a manfrotto fluid base? Yes and I have done it. You need to be careful, however, if you mount a large camera since the spread of the legs on the base are not big. The fluid base is exceptionally helpful to stabilize the camera when you're doing shots that take time to set up but don't require a tripod.